I can't believe I didn't review the first Serafina book; a student did an earnest book talk about it and started everyone in the class passing it on to each other. 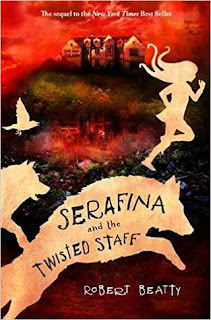 I loved Serafina and the Black Cloak, so I was eager to read the ARC of Serafina and the Twisted Staff from NetGalley. My only regret is that my students will have to wait to read it and I won't be able to discuss it with them! The novel starts happily, with Serafina coming out of hiding in the basement of the Biltmore, no longer just a rat catcher, but also a friend to Braeden Vanderbilt. As readers of the series know, that peace won't last long as there always seem to be evil forces at work in Asheville's mountains. This time around, the villain is able to use magic to control animals, and they are being used to hunt and attack Serafina and her friends. What I love about these books is that they are genuinely scary! They don't shy away from gore and are just frightening enough to disturb, but won't cause nightmares for middle grade readers. I'm excited for the third book in the series to come out in 2017.